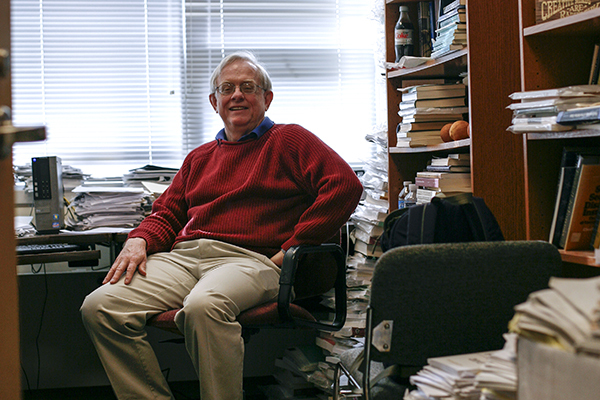 Faculty, like economics professor Donald Parsons, have warned that GW's reliance on tuition revenue could hurt future growth. Tuition revenue nationwide has flatlined this year, the first time in a decade the revenue institutions bring in hasn’t grown, according to a new report. Moody’s, a credit rating agency that grades universities like GW on their financial health, found that the amount colleges are expecting to receive from tuition this fiscal year is about 3 percent higher than last fiscal year, which is equal to the rate of inflation in the U.S. Some of GW’s top economics professors said GW could be increasing enrollment as a way to keep tuition revenues on the rise. The University expects to receive 5 percent more in tuition revenue this fiscal year compared to last fiscal year, according to this fiscal year’s operating budget. The increase might come from the additional 467 undergraduate students on campus this year, according to the University’s Office of Institutional Research. GW’s tuition cost has historically grown at about 3 percent each year for new students, but is locked in for returning students. GW brought in $651 million from tuition last fiscal year, an increase of about 5 percent in net tuition revenue, according to University’s budget office. The report also found that there is an anticipated 2 percent increase in the median amount that large private universities, like GW, receive from tuition this fiscal year compared to fiscal year 2014, according to universities’ estimates. But about a quarter of those universities are expecting tuition revenue declines of up to 5 percent. Growing revenue from tuition is critical for institutions like GW, which relies on tuition for 75 percent of its operating revenue. But because GW’s tuition, which crossed the $50,000 threshold last spring, is among the highest in the country, credit rating agencies and faculty have warned that officials could struggle to continue seeing the growth they need. GW’s debt load is about $1.6 billion, which faculty have said could hamper the growth of programs if officials aren’t able to bring in enough revenue to continue growing. GW makes debt payments of about $83 million each year, slightly more than the annual payout from its endowment. Economics professor Donald Parsons, a member of the Faculty Senate’s finance committee, said that the report doesn’t necessarily mean all institutions are bound to see low revenue tuition increases this year. “[GW] did manage to squeeze 5 percent growth, so will they do that this year? I don’t see it getting any less likely,” he said. Anthony Yezer, a professor of economics, said the University’s methods for estimating the amount it should expect to see in revenue are generally accurate. If officials are suggesting a 5 percent increase in tuition revenue, it’s likely to happen, he said. University officials instituted a new budget model last fiscal year, which redistributed the amount of money each school receives from each student for the classes taught in the school. Yezer added that Moody’s report could come out of a decrease in enrollment at more expensive universities because they’re considered “luxury goods.” During economic downturns, institutions with higher tuition costs tend to see lower tuition revenues if officials can’t increase enrollment.